The Saturday after Thanksgiving is for decorating – it’s pretty much the kick-off to the Christmas season. With Christmas music setting the tone, the house is transformed from donning its metaphorical street clothing into its finest holiday dress. It’s something that Mike and I really look forward to (I’m not just lumping him into that statement, he is all about the Christmas decorating). Two days before Luke was born, Mike and I decked the halls. While Mike put up the tree (which also entails covering it in as many lights as humanly possible), I went about decorating the living and dining rooms with nutcrackers, angels, stockings and other Christmasy do-dads. Later that evening (Mike was still working on the tree – 720 lights is a time commitment) my in-laws came over to keep us company. It was a festive evening of anticipation for both the upcoming season and Luke’s (at that point Hans’) big arrival. Little did we know, that would actually be less than 48 hours later. From the moment that Luke came home, until yesterday afternoon, the Christmas tree was lit. Seriously, we never unplugged it. In addition to being the center of our Christmas decorations, the tree became a large night light while we were up with Luke in the dark and something to carry him over to, to look at and tell him about, during the day. Sometimes we’d set his bouncer next to the tree and he’d turn his head and just stare – at what probably looked to him like a bunch of blurry bright blobs. For as long as I can remember, I always dreaded taking down the Christmas decorations (Mom, before you chime in, note that that sentence isn’t insinuating that I necessarily helped take down the Christmas decorations as a kid… merely that the fact that I didn’t look forward to when you did it). As an adult, I look even less forward to undecorating – since now not only is Christmas being packed up, but I have to be the one to do it (Mike helps). 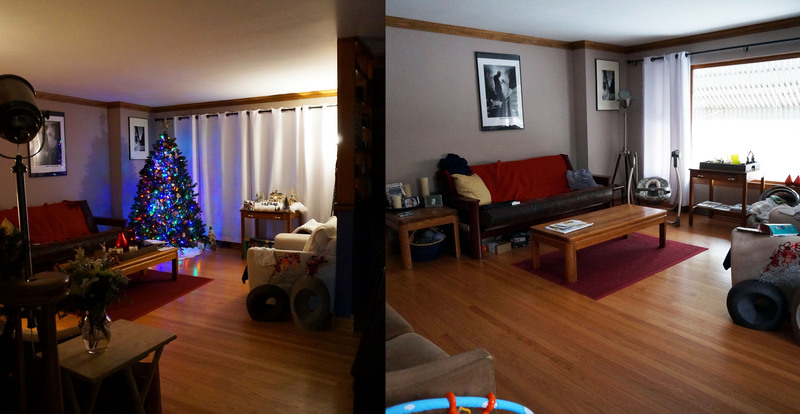 When I woke up with Luke this morning around 6:30, it was a little strange not seeing the familiar multi-colored glow of the Christmas tree welcoming us into the living room. In its place, Mike had put a single night light. And yet, as the sun started to rise and the room came more into view it felt fresh, open and familiar. Almost like a visual to the end of an era (albeit a short era) – we used up the last of Luke’s newborn diapers last night, he’s out of his newborn clothing as well. Yesterday the holidays were officially over and today I have a 6 week old baby wearing size 1 diapers and his 3 month clothing and waking up from his nap as I type this… gotta go attend to Luke! MIKE: Look, Valentine’s Day isn’t everyday, but I can see how you’d think that when you live with me and everyday is Valentine’s Day. SYDNEY: Will you be needing on of Studio255’s Valentine’s Day cards for Valentine’s Day this year? They’re on that table over there. MIKE: I make all my own cards now….